Hmmm…. this one was interesting. As you know I joined the ‘Every Day Matters’ group. In this group the leader assigns an object per week out of your ‘everyday’ life to draw. This week it was a soda can. I have to say, if it wasn’t for this challenge, I would NEVER have continued this drawing once I started it. It looked easy enough but when it came down to it, shiny metallic is not the easiest thing to draw with a regular pencil. 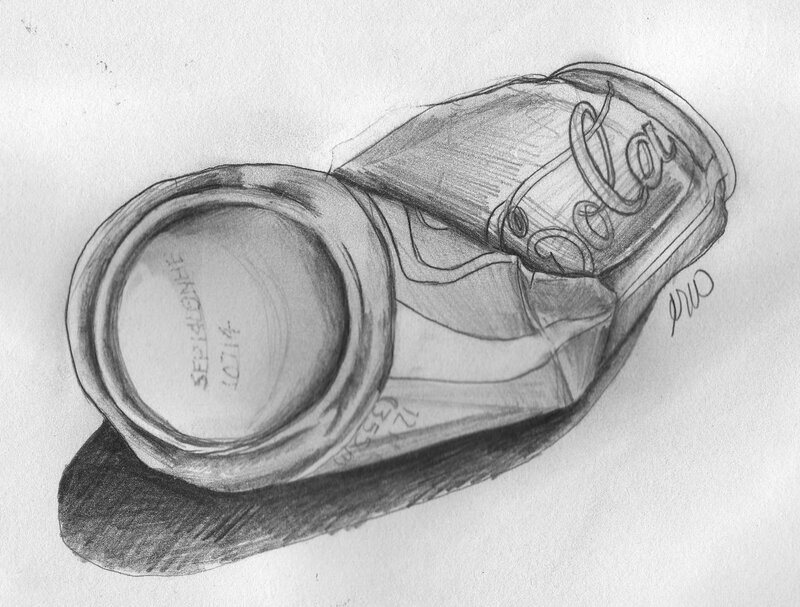 Eventually my eyes adjusted to the shadowing and I managed to find the depth of the can. Not one of my best but I am better because of it! I think it’s great that you persevered despite your misgivings (btw – no need for any!!) I have never been able to see anything that I see through my own eyes in black and white so really struggle with monotone sketching and avoid it like the plague! Very nice. I find the easiest looking things are the hardest to draw. You did good! You’re so right about the difficulty of depicting metallic material, so congratulations on sticking with it.